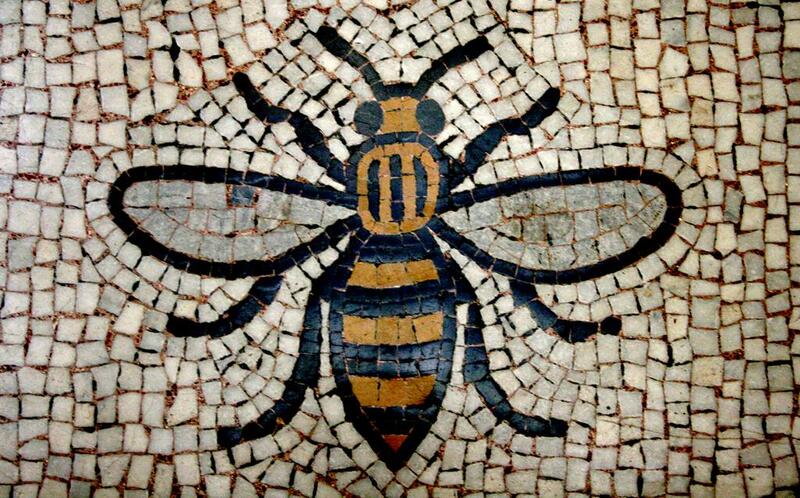 Home to its most ubiquitous and iconic design, Manchester Town Hall and the Manchester Bee are inseparably linked. Designed by Alfred Woodhouse and built between 1868 to 1877, the Hall features the bee both outside and inside the building. 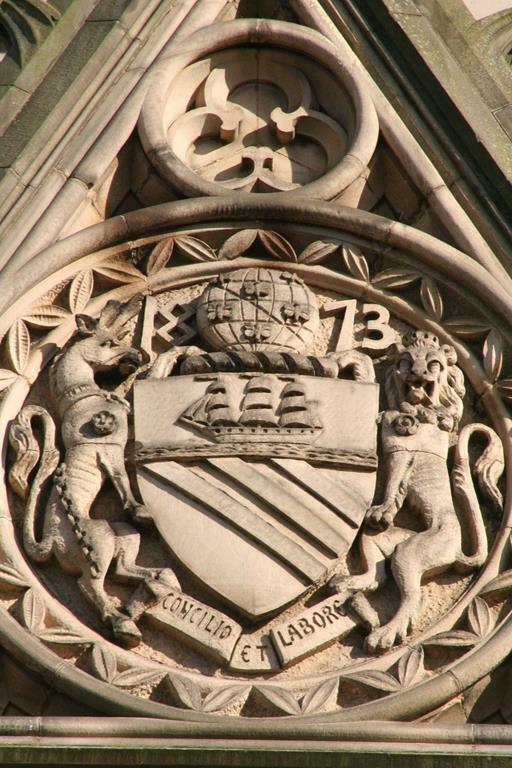 Standing outside the main entrance on Albert Square, look up past the statues and you’ll see a large version of Manchester City Council’s coat of arms, with the date 1873 incorporated into it’s design. 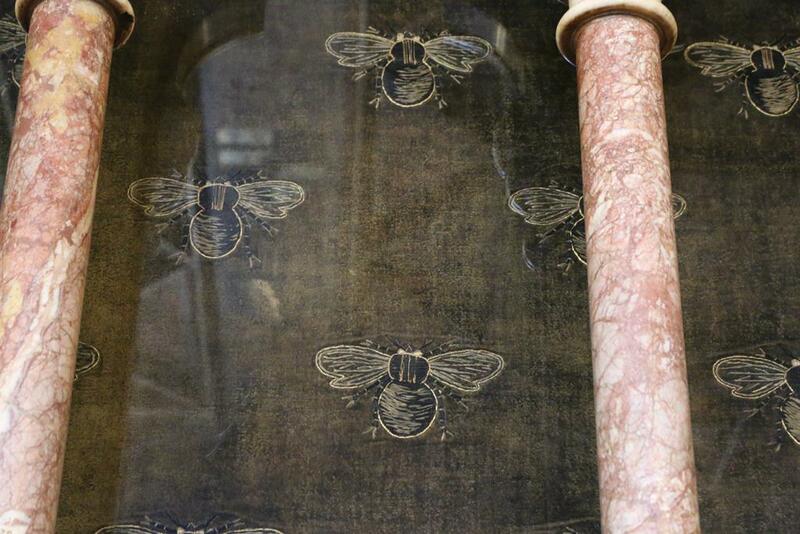 Five bees can be seen hovering over the globe, as opposed to the seven that appear on the normal coat of arms. A similar coat of arms can be found above the Cooper Street entrance to the Hall, with the date listed as 1874. 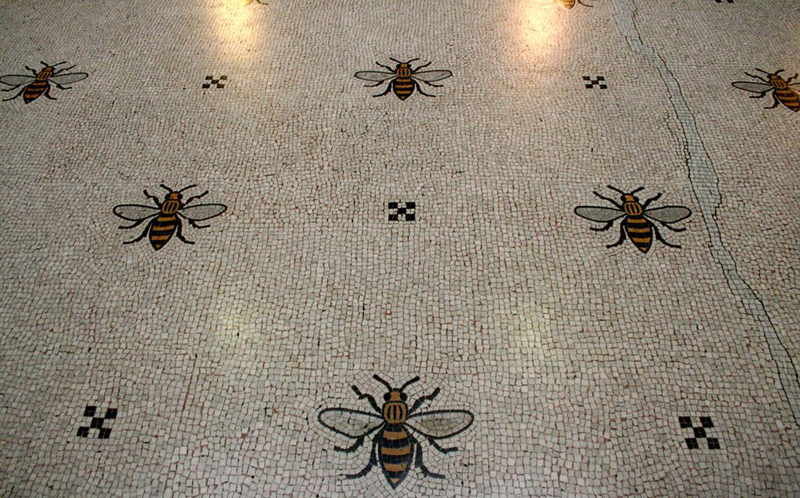 You can find more information on the coat of arms and it’s bees here, so lets head inside and up to the first floor, where outside the Great Hall (Home of Ford Madox Brown’s The Manchester Murals), you’ll find the mosaicked floor area known as The Bees. Originally laid out by Venetian craftsmen, the 4,500 yards of beautiful marble flooring in the building primarily feature cotton flowers along its length. But here, 67 bees are laid out in an overhead design. These mosaics are the inspiration for a lot of the subsequent bee designs that have appeared over the years, which I’ll be highlighting in future blog posts. 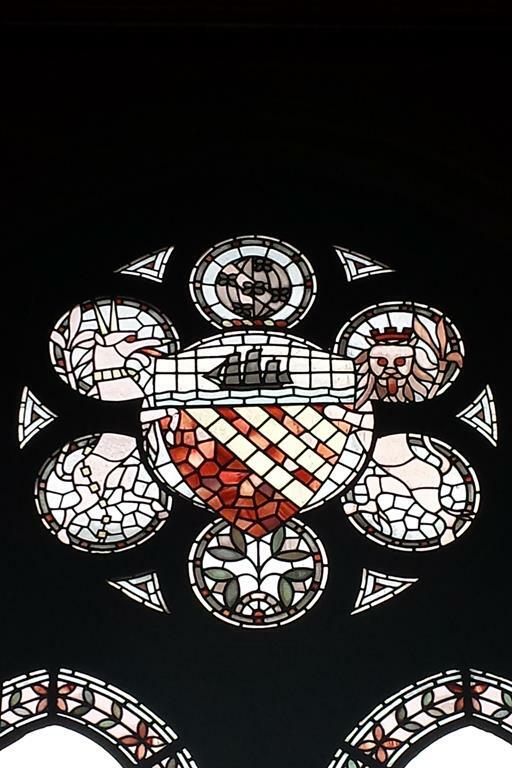 Inside the Great Hall, look up and you’ll see the coat of arms of countries and cities that were the principal trading partners with Manchester during the Industrial Revolution. Around each one you’ll notice bees flying around them. Bees also adorn the mantelpiece above the fireplace in the Reception Room. Unfortunately, they’re somewhat obscured by glass paneling. 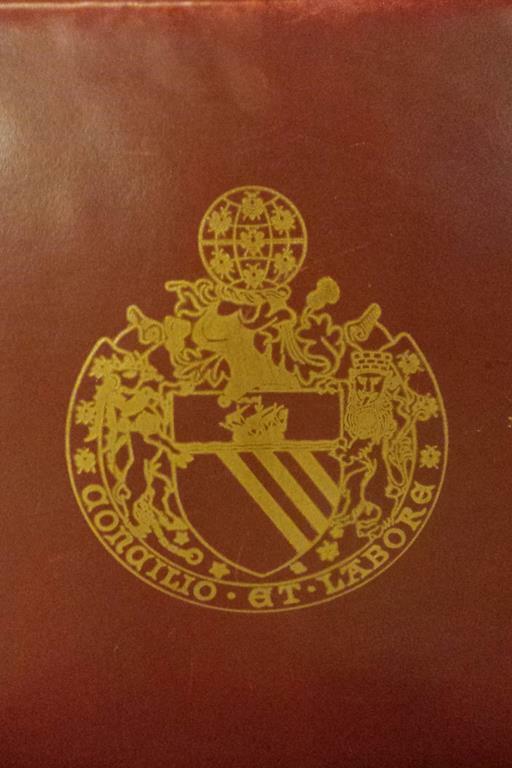 Manchester’s coat of arms and its bees can be found adorning many and various surfaces inside the building, such as stained glass windows and wall adornments with the largest located in the main council chamber. If you’d like to see the bees for yourself, I’m afraid it isn’t possible for the next few years. The Town Hall closed in January 2018 until 2024 for extensive refurbishment.